The Zoom-Hexanon AR 35-70 mm / F3.5 is a one-touch zoom with a combined ring for focal length adjustment and focusing. 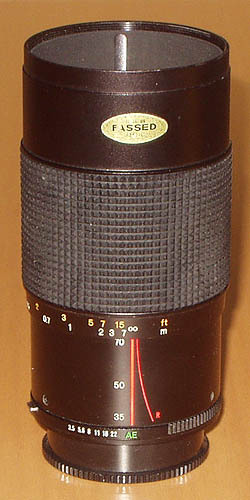 It was introduced at the time of the FS-1, and was Konica's first zoom lens in this very popular focal length range. Some years later, it was replaced by the Konica Zoom-Hexanon AR 35-70 mm / F4, a completely new two-touch zoom design which itself was superseded by the plastic lens Zoom-Hexanon AR 35-70 mm / F3.5-4.5. The Zoom-Hexanon AR 35-70 mm / F3.5 already has a bearable size and medium weight, the lens barrel is still completely made of metal. The lens changes its overall length when the focal length is changed – the longer the focal length, the longer the lens. As on almost every Konica zoom lens, the front element rotates when focus is shifted, making the use with polarizers and gradated filters a bit cumbersome. As the Zoom-Hexanon AR 35-70 mm / F3.5-4.5 was built only for a few years and already had a smallest aperture of 22 when introduced, no changes were applied to this lens, there is only one variation. 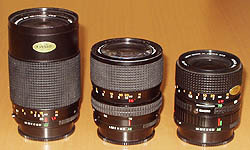 All these lenses are of the late style with focusing ring with checkered rubber inlay, a smallest aperture 22, and the green AE mark with a rectangular AE lock button. The Zoom-Hexanon AR 35-70 mm / F3.5 has no special provision for close-ups, but can be focused down to 0.35 m (1 ft 13/4") over the whole focal length range. This enables the lens to do some nice close-ups, but does not suffice for real macro shots. The Zoom-Hexanon AR 35-70 mm / F3.5 has very good image quality for its time. Images are sharp and contrasty. There is a bit of barrel distortion in the wide-angle range that can be seen with straight lines along the image edges and a very weak pincushion distortion in the telephoto range that is not too obvious even with straight lines along the image edges. Even in the wide-angle range, the lens shows little vignetting. Of all Konica 35-70 mm zoom lenses, it is optically the best. The construction of the lens is a bit unusual. The focusing and zoom ring is pushed forward for longer focal lengths and protrudes several centimeters over the front lens element at the long end, so that the front element is deeply recessed. In the wide-angle range the front element protrudes over the setting ring, when the lens is being focused to shorter distances. Therefore, both setting ring and front element barrel have a thread – the front element barrel with a diameter of 55 mm for filters and the focusing / zoom ring with a diameter of 62 mm for the lens shade. 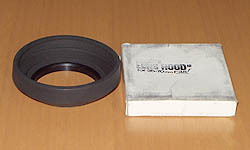 The lens was delivered together with a matching round, collapsible rubber screw-in lens shade. Despite this lens shade being quite shallow, it does provide good protection, because the front element is recessed so deeply, it is well-protected even without shade at longer focal lengths. Zoom lenses in this focal length range and with comparable speed have been very popular at the time, many manufacturers sold these lenses in a bundle as the only lens together with their camera bodies. In my opinion, such a zoom lens cannot replace a fast standard lens, the limitations caused by the slower speed are too strong. 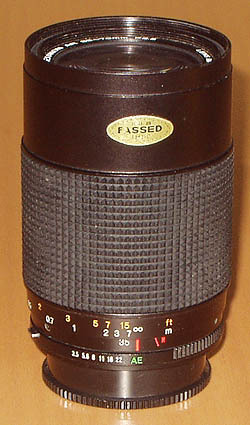 Because the Zoom-Hexanon AR 35-70 mm / F3.5 was built for some years, it is neither very common nor rare. It fetches prices in the medium range. If you are looking for a zoom lens that covers the range from moderate wide-angle to moderate telephoto with a very good image quality and moderate weight, this lens will serve you well.